Cornelia A. (Connie) Clark was appointed to the Tennessee Supreme Court in September 2005 and was elected to full eight-year terms in 2006 and 2014. 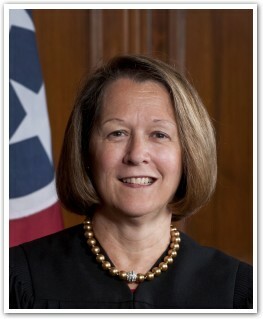 She served as chief justice 2010-2012, becoming the second woman in Tennessee history to serve in that role. Prior to her appointment to the Supreme Court, Justice Clark served as director of the Administrative Office of the Courts for six years. Clark was appointed circuit court judge of the 21st Judicial District in October 1989 after practicing law for 10 years at Farris, Warfield & Kanaday, now Stites & Harbison. She was elected to a full eight-year term in 1990, and was re-elected in 1998. Clark earned her bachelor’s degree from Vanderbilt University in 1971 and her Master of Arts in Teaching from Harvard University in 1972. Before attending law school, Clark taught high school history and government for four years. In 1979, Clark received her juris doctorate from Vanderbilt University School of Law, where she served as a member of the editorial board for the Vanderbilt Law Review. In 2017, Clark received the Justice Martha Craig Daughtrey Award from the Lawyers' Association for Women, Marion Griffin Chapter.In 2015, Clark received the Pioneer Award from Vision 2020. In 2010, Clark was inducted into the Nashville YWCA’s Academy for Women of Achievement and was also named Appellate Judge of the Year by the Southeastern Chapter of the American Board of Trial Advocates. In 2005, Clark received the Williamson County Bar Association’s inaugural Liberty Bell Award for promoting a better understanding of the rule of law and encouraging civic responsibility. Clark is a native of Franklin, where her family has lived for eight generations. An active member of the community, Clark served as Franklin City Attorney and as a board member of the Williamson County-Franklin Chamber of Commerce. Clark is a life-long member of First United Methodist Church in Franklin, where she currently serves as lay leader and has previously served on the Board of Trustees and as chair of the Staff Parish Relations Committee, Administrative Council and the Site Selection and Building Committee. She also serves as board chair of the United Methodist Publishing House and as a Trustee of Martin Methodist College. Past board member of Goodwill Industries of Middle Tennessee, Inc.
Co-chair of the original Steering Committee of Franklin Tomorrow, Inc.